President Recep Tayyip Erdoğan said his visit to Germany was an important step in overcoming roadblocks on normalizing bilateral ties with Berlin. The leaders of Turkey, Russia, Germany and France will convene this month in Istanbul to work on a solution to the ongoing conflict in war-torn Syria, President Recep Tayyip Erdoğan said yesterday on his way back from a three-day official visit to Germany. "A quartet summit will be held in Istanbul with Russia, Germany, France and Turkey. I have spoken to [French President Emmanuel] Macron, he has a positive approach to it. [German Chancellor Angela] Merkel said 'there are elections on Oct. 14 in Bavaria, let's do it after that,'" Erdoğan said to Turkish journalists accompanying him during the visit, and underlined that the quartet summit "was significant and an important step." Erdoğan was in Germany between Sept. 27 and 29, where he held meetings on bilateral relations and regional issues with his German counterpart Frank-Walter Steinmeier and German Chancellor Angela Merkel. In a press conference on Friday with Erdoğan in Berlin, Chancellor Merkel had said the situation in Syria, including the recent developments in northwestern Idlib province were discussed during the bilateral meetings. "We favor there being a four-way meeting, because the situation is still fragile, between the Turkish president, the Russian president, the French president and me. We aim to do this in October," she had said. Representatives from all four countries had met on Sept. 14 in Istanbul for preparatory work on the meeting. Following the meeting in Istanbul, Turkish Presidential Spokesperson İbrahim Kalın had said that all parties agreed on the necessity of a political solution for Syria. Turkey and Russia, as well as Iran, established a trilateral entity on Syria, known as the Astana process, to find a political solution to the crisis in the country, and most recently Ankara and Moscow reached a deal on Idlib that halted possible attacks on the opposition held province by the Bashar Assad regime. According to the agreement reached in Russia's Sochi on Sept. 17, a 15-to-20-kilometer-wide demilitarized zone, which will be patrolled by Turkish and Russian forces, will be established as of Oct. 15. Radical groups, including the Nusra Front [Hayat Tahrir al-Sham] will also retreat from the region, and the area will be free of heavy weaponry. The moderate opposition groups in Idlib will, however, remain in areas where they are already present. Erdoğan also said German officials were provided with information and details of the Idlib deal upon their request. "They [German officials] appreciate the results reached in Idlib," he said. "Our aim is to carry the process to an even more positive stage," he added. Meanwhile, Erdoğan criticized, a recently announced committee, which would include representatives from the U.S., France, Germany, Egypt, Saudi Arabia, Jordan and the United Kingdom, to draft a new constitution for Syria. "Now they talk about a small group. [...] They don't invite Turkey to these meetings. They don't even invite Syria. They are to hold a meeting on Syria and Syria is not included in this meeting," he said. Following the Idlib deal, about 50,000 to 60,000 civilians, who were previously displaced or escaped regime bombardment prior to the deal, have been able to return to their homes in the province. Turkey insisted on reaching a deal on Idlib, arguing that a regime attack on the province would cause a humanitarian disaster, as it holds about 3.5 million civilians. Turkey's diplomatic efforts on preventing a possible massacre in Idlib have also been praised by the international community. Iran and Russia have backed the Assad regime in Syria, while Turkey has been supporting the moderate opposition. The U.S., however, has been supporting the PKK terrorist group's Syrian affiliate, the People's Protection Units (YPG), which leads the group known as the Syrian Democratic Forces (SDF) under the pretext of fighting Daesh. The PKK is listed as a terrorist group by the U.S. the EU and Turkey. Ankara also considers the YPG to be the PKK's Syria branch and a terrorist group. The disagreements over U.S. support for YPG terrorists has led to a straining of ties between the two NATO allies. Erdoğan also commented on bilateral issues between Ankara and Berlin, saying one of the issues that remains unsolved is the lack of sensitivity shown by German authorities over the PKK terrorist group and the Gülenist Terror Group (FETÖ). "We expect a more effective fight from German authorities against these [PKK, FETÖ]. We have conveyed our expectations. It is our foundational right to put on an effective fight against these groups that threaten our national security," Erdoğan said. The president also urged German officials to communicate with Turkish officials for better communication between the two counties regarding the judicial process about some detained German nationals in Turkey, rather than unofficial sources who may be "against the Cabinet or against the President." Erdoğan said there is a difference in stance on FETÖ between Ankara and Berlin, and that it was "difficult to understand" the reluctance of German officials in cooperation against the group, despite giving them a large amount of evidence and court decisions. He added that a list of names, those sought by the judiciary in Turkey for links to PKK and FETÖ, have been given to German officials and U.S. officials in New York, ahead of his visit to Germany. The U.S. has demanded names, rather than boxes of evidence, Erdoğan said, and added that some 20 names were given to U.S. officials. The president also criticized Berlin for not meeting the extradition demands by Ankara over fugitive Can Dündar, who currently lives in Germany. "This individual [Dündar] is convicted by Turkish courts for spying and disclosing state secrets," Erdoğan had said during the press conference on Friday. Erdoğan said Dündar, the former editor-in-chief of Cumhuriyet, has been convicted to five years and 10 months in prison in Turkey. "We have the extradition agreement. It is your responsibility to extradite him to us," Erdoğan said, criticizing Berlin. He also said Germany's demand of releasing some detained German nationals in Turkey is not up to the government but rather it is a judicial process in Turkey. "I reminded them that there was rule of law in Turkey," he added. Erdoğan expressed appreciation for the hospitality and interest of the German president and chancellor during the three-day visit and also highlighted the willingness on both sides to further develop economic ties. "I can say that we have reached an agreement to strengthen our bilateral economic relations," Erdoğan said. He recalled that the Turkish Minister of Finance and Treasury Berat Albayrak was in Germany on Sept. 21 and that on Oct. 25 the German economy minister will visit Turkey with a delegate of businessmen. "We will increase these types of meetings," Erdoğan said. As part of normalization efforts between Turkey and Germany, coupled with Berlin's support to Ankara following some economic steps by the U.S. against Turkey, both allies have made remarks to increase economic cooperation. 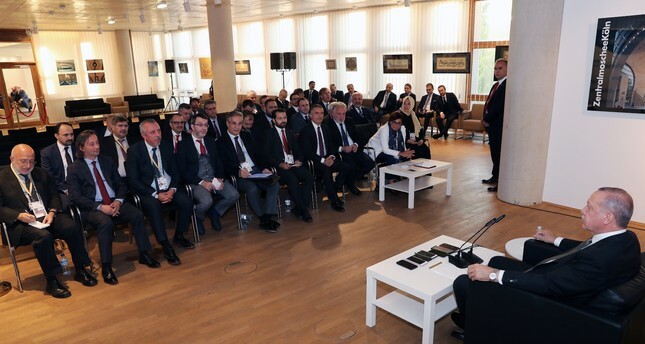 Erdoğan said the meeting with representatives of German companies who have investments in Turkey as well as the meeting with Merkel on Saturday was productive and fruitful. He added that both countries can work on joint projects in the defense industry and railway transportation, as well as manufacturing of devices needed in the health sector. Speaking on economic bilateral relations with Germany at the joint conference on Friday, Erdoğan noted that the two countries had reached a consensus on reviving cooperation mechanisms. "I explained to Merkel that the Turkish economy was founded on solid foundations. I would like to reiterate here that the effects of speculative-based periodic fluctuations on our economy were limited thanks to the structural measures we have taken. As in other areas, our country is well-prepared for and has the strength to avert possible threats in the field of economy," he noted. Erdoğan also said the far-right tendencies and Islamophobia were still ongoing problems in Germany. He added that the peace and safety of the Turkish diaspora was also a concern for Ankara. "The attacks against mosques and [Turkish] foundations are still concerning. This situation is contradictory to European values. The concepts of democracy, superiority of law, equality and plurality are thus put to question," Erdoğan said. Germany is home to about 3 million people of Turkish descent. The Turkish community in Germany has long accused the country of discrimination against them, despite many of them being the second or third generations to live in the country. Far-right tendencies against the Turkish community have included verbal and violent attacks, such as arson attacks on the Turkish community's establishments.